Make a statement at your next dinner party. 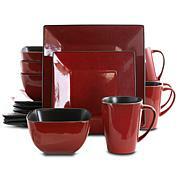 With a sophisticated and bold color block design this set is pure style and individuality. The two sets of bowls accommodate meals with more courses or extra condiments and tasting options for all to share. 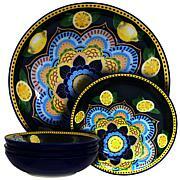 Highlight your meal and accentuate the naturally scrumptious hues of the foods this plate so elegantly displays. 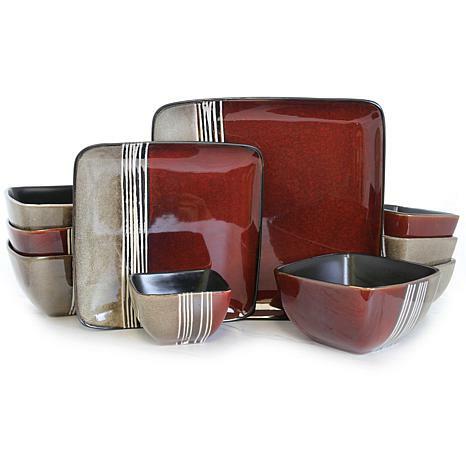 This item is given 2 stars because, yet again, this is a company that DOES NOT send a pre-paid return label which means that because this dinnerware set is so heavy you'd pay a fortune to return it to California on your own. The packaging was awful, ripped box. Looked as though it had been returned and then reshipped. All of the contents were intact (first thing I checked). 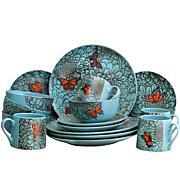 The dinnerware set itself is pretty. 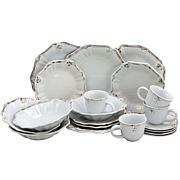 The dinner plates are large enough to serve as serving platters for roast etc. BE CAREFUL before you order. This is the second item I've received from HSN that offered NO WAY to return. These dishes arent worth the money. Yes they look good but chip very EASILY!